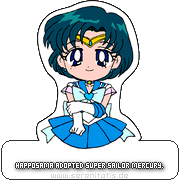 What have been some of your favorite crossovers to Sailor Moon in the fandom? Are there any you haven't seen done that you think would be cool? Miraculous Ladybug. Considering there's subtle implications Minako lived in France for a while (mostly the Savate kicks. For I don't know what else would inspire pre-Sailor V!Minako to study that particular martial art if she decided to learn one), having her being inspired by the heroes of Paris would be just right. Had already done a raw sketch as a suggestion for Chibijennifer's page; the story would have involved Mamoru telling Usagi that he had been mistaken for an Akuma by Ladybug when he was on vacation in Paris and tried to help (in full T. K. attire, of course) when a Monster appeared. the story would have involved Mamoru telling Usagi that he had been mistaken for an Akuma by Ladybug when he was on vacation in Paris and tried to help (in full T. K. attire, of course) when a Monster appeared. His fault for dressing like that. While I haven't seen any, yet, I like the idea of Sailor Moon and Percy Jackson; because Sailor Moon taps into a lot of Greek mythology. Sailor Stars (manga) with Madoka; it is essentially the exact same story: being a magical girl comes with a price. I'm reading Sailor Moon/Naruto crossovers right now. I've also read some Sailor Moon/Yugioh crossovers as well if these count. On infidelity: The Pot has not just met the Kettle, they are getting jiggy on the top of the stove. Sailor Moon and Wedding Peach because I think that it would be a very interesting crossover, plus they are both my all time favorite anime and manga series too. It would be nice to see more Sailor Moon and Wedding Peach crossover fanfiction stories and videos though since there's not a lot of them.